Hannah Ostroff works as a public relations specialist at the Smithsonian Institution’s Office of Public Affairs. Ostroff is on the team that manages the @smithsonian accounts where they showcases pieces from the collections of all of the Smithsonian museums and projects across the Institution. I spoke with Ostroff about how she became interested in social media, her favorite aspects of the job, challenges of public relations and advice for aspiring social media managers. Hanna: How did you become interested in pursuing a career in museums and social media? Hannah Ostroff: I guess the first part of that answer is I wasn’t initially. I majored in English and American Studies in college and graduated not really sure what that would mean in terms of a career. I knew I wanted to write. I knew I cared a lot about cultural institutions and the arts. Finding a way to merge those two was ideal. After I graduated, I was doing this program through my college that was based in D.C. and part of it was taking classes in new media, but it was also an internship. So through that, I interned at the American History Museum in their new media department. And that was such a good introduction to the Smithsonian. I’m not from this area, so I knew some about it [the Smithsonian] but I learned so, so much more that summer and then so much more about the web and digital and social that I hadn’t experienced. I had written some, but I hadn’t really been immersed in that kind of world. So, doing that summer was definitely something that said I would really love to work here, I would really love to be a part of this place, and I really care about how we communicate what we’re doing through this medium. Then my internship ended, and I ended up taking a job down in Williamsburg, Virginia, which is where I went to school, as a journalist for a daily newspaper. That was a lot of writing and focusing a lot on museums and culture and arts and things like that. Then, I sort of realized that maybe journalism wasn’t a long-term thing in that format [for me]…. Seeing the Smithsonian and all that it does is incredibly powerful and seeing how powerful a tool like social media and the web can be in communicating that message was really inspiring to me. Hanna: What are your main duties as a public relations specialist? Hannah Ostroff: Primarily, I am focused on social media. I am kind of our day-to-day social media manager. Another person on our team is our lead social media strategist, and she used to do the day-to-day in addition to the big picture. But now we’re fortunate enough to have two people. She focuses on the big picture and interfacing a lot with our many social media managers across the institution. I am more the boots on the ground—writing, researching content, doing customer service through social media, and all of those good things. That also includes, in addition to putting out content, which is a lot of what I do, finding ways to showcase the depth and breadth of the Smithsonian and how we’re relevant today, and then having timely posts. It’s also customer service and being able to see these conversations that are happening online, and sometimes that means translating them to other people on our staff to say hey we’re seeing this discussion or this is something that people, maybe, are upset about, and then figuring out what is our conversation, and how does that go from there. The other part of my job is as a member of our public affairs team, and I also write for our Smithsonian Insider website which is all our Smithsonian news. So putting on my journalism hat for that which is a lot of fun to write things that are longer than a Tweet. But it is another great way to really get out into the museums and the work that we’re doing and be able to report back and share those stories with the broader public. Hanna: What does a typical day look like for you? Hannah Ostroff: There is no typical day at the Smithsonian. That is the easiest answer. Really every day is different. Especially working in PR and on social media, you don’t always know—you may think you know what your day is going to be, but then things happen. I think during the most typical day, I spend a lot of time reading blog posts from across the Institution and keeping up to date on what our museums and research centers and other organizations within the Smithsonian are doing on social media to help amplify those messages. As well as [keeping up to date on] what similar institutions are doing and trying to find inspiration and collaboration there. I also work very closely with the various social media managers. So, sometimes that’s them coming to me and asking if we can help share something from, what we kind of call ourselves, ‘big brand’ Smithsonian, and sometimes that’s me reaching out to them and saying something like, ‘Veterans day is coming up, what would be a good thing to share, do you have something new?’ and letting that go back and forth in conversation. I try to get into the museums as much as possible. That’s not always easy, but I feel like it’s important to have experienced some of these exhibitions before I can talk about them, and it certainly makes me do my job better. And then there are days that are less typical. Maybe we have an event that we’re covering live, or it’s a press conference, or a social event that’s happening at one of the museums where we will do a Tweetup or something like that. But our social team here centrally is really a resource to all of the various units within the Smithsonian. So whether that’s sharing something or being an extra set of hands for a Facebook Live or answering a question about best practices, that’s what we’re here for. Hanna: What are some of your favorite parts of being on the team that manages the @smithsonian account? Hannah Ostroff: I love when people can connect with us on a really personal level. And sometimes that might be that I make a cheesy joke and someone appreciates that the Smithsonian has jokes. But sometimes it’s more serious things- people who see themselves represented in a museum, sometimes for the first time. Or, we share a story around September 11 of a letter we have in our collection that someone wrote, and the person who had wrote it had survived— it was a happy ending in that case. But we shared it, and somebody commented on our Instagram that this was her sister who had wrote it and who had donated it. Just being able to all of a sudden have a conversation with someone who was so connected with this. I wouldn’t ever get that opportunity. So really being able to share these stories and connect on a human level has been really a powerful experience for me and it’s a privilege to get to do that. Hanna: What are some of the main challenges that arise when working in social media management? Hannah Ostroff: There are only so many hours in a day. There are only so many people on our staff. It’s a very fast paced environment and it can be hard to stay on top of all of that, especially those kind of crazy days. I always want to be as accessible and engaging and helpful as possible—that’s one of the things we really strive for. And thinking strategically about the best way that we can use our resources, and it can be overwhelming—all of the different platforms, do we want to be on Snapchat? And there are all of those questions that we think about a lot, but we think about them really strategically, and of what’s the best way to serve our audiences and to serve the Smithsonian and to communicate these messages. 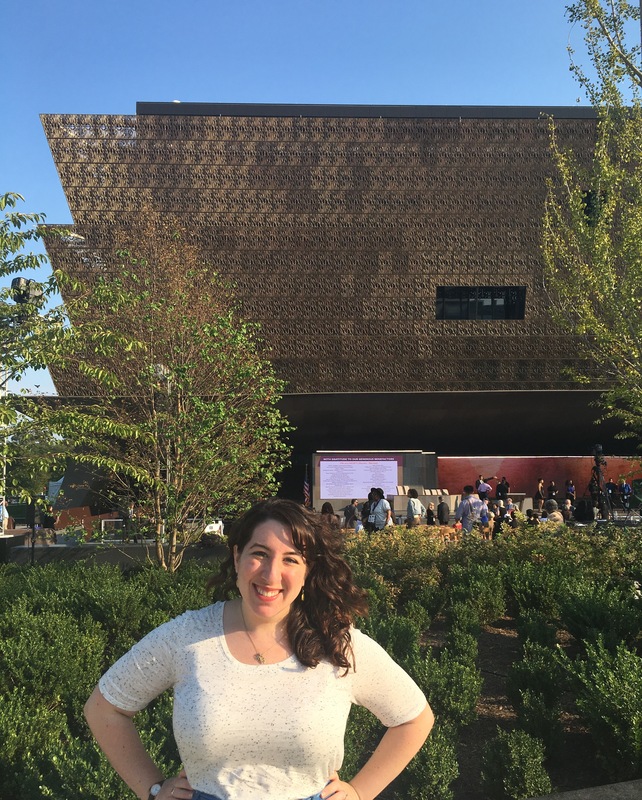 Hanna: With the opening of the National Museum of African American History and Culture (NMAAHC), was it challenging to find balance between the opening and showcasing other projects? Hannah Ostroff: We have an overall social media strategy that we created, and that’s kind of how we govern ourselves day to day and it includes an editorial calendar and working with all of the units. But then we also created specifically a strategy for the museum opening and how we would incorporate that. Because it would be very easy for that to be 100 percent of what we were doing, or maybe we would think we didn’t do enough, or all of those questions that we wanted to ask far enough in advance that we could really plan for it. And so thinking about how much content in the lead up were we doing, which platforms were we doing and how. The museum opening- it was the first museum opening that I have been a part of but it was also the first Smithsonian museum to open in the social media age, so it was a lot of uncharted territory. But it was really gratifying to see how the whole Smithsonian came together to either find connections to the collection at that museum or find their stories or simply promote what a wonderful addition it was to the Smithsonian family. And so that was a way that we were all having this conversation at the same time. Hanna: What have been some of the highlights of the job so far? Hannah Ostroff: There are a lot. I think being a part of the new museum opening was an incredible privilege personally—to be able to see something that had been so long in the making, and that just meant so much and within the Smithsonian and then outside of it. And once again, being able to talk to people online and in-person who were so overjoyed that this museum was opening, that these stories were being told and being told by the Smithsonian. So being there—I attended the dedication, I was doing a lot of live coverage that day. It’s hard work, and it was being here at seven in the morning, and it was 100 percent worth it. So that’s a definite highlight. But I think anytime I get to see the Smithsonian from someone else’s perspective. I work in a castle-that’s a ridiculous thing. And sometimes I forget because I am sitting at my desk, and I’m doing my job, I’m answering email and it can feel mundane because this is my job, this is my day-to-day reality. But sometimes I’ll be walking out and I’ll see someone just staring up at the castle or taking a picture of it on their phone, and realizing this is a really important place and this means a lot to so many people. And I get to be here and I get to have a voice-be the voice in some ways-of the Smithsonian. It’s really cool. Hanna: What is currently your favorite platform to create content for and why? Hannah Ostroff: They all have pros and cons for sure. I think lately I’ve really enjoyed Instagram. Our audience there has grown substantially as Instagram has become such a powerhouse platform, not just for us. It’s such a visual medium, obviously, but it’s also been a challenge to figure out how to tell compelling but concise stories. Twitter is, obviously, concise when it’s 140 characters, but I think for me writing, it’s a challenge but sometimes I have the most fun doing it there [on Instagram]. Sometimes it’s a lighthearted approach, sometimes not, but really figuring out how to tell a story. Because you can’t link anywhere else, so it’s telling these compact stories and trying to bring people in with an image and a few lines of text and feel like they can take something meaningful away from that—whether they learned something knew or they saw an artwork they’d never experienced before. Hanna: Where do you find inspiration when developing social media content? Hannah Ostroff: I follow a lot of people and organizations. We follow a lot of, as I said, not just Smithsonian museums, but other museums that do a really fantastic job. But frequently I am so impressed by Smithsonian colleagues who are doing phenomenal work at their museums and organizations. I’ll tell them, ‘oh yes, I am going to steal that in the future.’ We have so many people who really think so hard about this, that it’s not just a fluffy little throw away thing. Hanna: What advice would you give to students approaching graduation who are interested in pursuing a career in social media or specifically social media and museums? Hannah Ostroff: I think that social media primarily is telling stories, and so the more you can do to make yourself a good storyteller, and for me that meant working as a reporter. But stories take lots of forms. And there are certainly lots of different mediums than just words and we’re seeing video storytelling and photos are huge, as well. So, I think getting as much experience as you can doing those sorts of things. Writing is hard and it takes a lot of practice and a lot of learning. I think getting experience—doing things like shadowing somebody who works in that kind of field and really understanding what goes into it because I think sometimes people are surprised by the strategy or by the challenges that come with this role- that it’s not all fun and games, there is a lot of fun to it as well. But I think being able to really understand what you might be getting yourself into and so knowing that’s a good fit. And certainly being in museums and experiencing them as much as possible in person and online and seeing where things are going on because this is changing so fast. And the best thing I think that anyone can do, but especially someone looking to go into media, PR, writing, is to be as aware and educated on what’s next and what’s going on now in the field.